Trade fights bruised Justin Trudeau’s government all year. The question for 2019 is whether businesses can start to capitalize before anything unravels. The Canadian prime minister, heading into an election year, is doubling down on championing free trade. His argument is that better, modern trade deals are an antidote to the forces driving protectionism globally -- including Donald Trump, the self-declared “Tariff Man” next door. One pact spurned by the U.S. president, but salvaged by Canada and others, will start to bear fruit this weekend. The outlook for Canada, however, is murky. The nation still relies on the U.S. for most of its trade, and gains from an agreement with the European Union have been slow to materialize. Hurdles remain for a revised North American trade deal, and American steel and aluminum tariffs still in place. A brewing feud with China after the arrest of a Huawei Technologies Co. executive has also thrown Canada’s fastest growing export market into doubt. Canada struck a deal in January with Japan and others to save the Trans Pacific Partnership, after the U.S. backed out. The revamped pact, known as the Comprehensive and Progressive Agreement for Trans-Pacific Partnership, created a trading bloc that will see its first round of tariff cuts Sunday. The second round comes days later to start the new year. Along with Japan, Australia, Mexico, Singapore and New Zealand, Canada was among the first six nations to ratify the 11-country deal, which ensured it will partially kick in and gives them a head-start on reduced tariffs. “It was consequential to be in the top six,” Carr said, while crediting the opposition Conservative Party for cooperating with his Liberal government to speedily ratify the enacting legislation. Canada also reached an agreement with the U.S. and Mexico to update the North American Free Trade Agreement, and hosted talks to overhaul the World Trade Organization. Still, there may be trouble on the horizon for the Canada-U.S. relationship. No subject consumed Trudeau’s government more in 2018 than U.S. trade talks. After more than a year of grueling NAFTA negotiations, he and Trump reached an agreement on Sept. 30. Since then, the Conservatives have complained Trudeau failed to get a better deal, criticizing concessions including extensions on pharmaceutical patents. The tentative pact still needs to be ratified, and there are warnings in the U.S. Congress that changes will be needed for passage. Trump has threatened to give notice of quitting the existing deal to pressure Congress to pass its replacement. Carr downplayed that. “The wise course is to respond to what leaders do, not on the speculation of what they might do,” he said. The stakes are high. Canada relies on exports for about a quarter of gross domestic product, and it still depends on the U.S. as its top partner, although not as heavily as it once did. 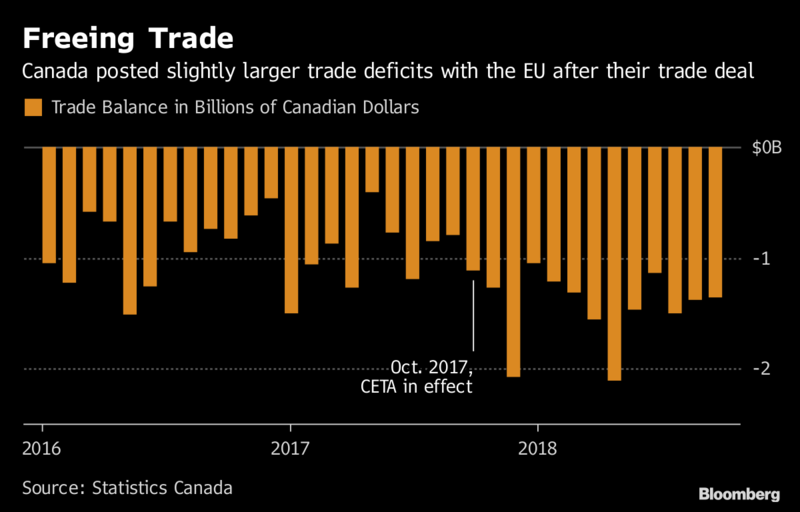 The American share of Canada’s total trade has eroded over the past two decades, from a peak of about 80 percent to 70 percent this year, down half a percentage point from when Trudeau took office. Meanwhile, Canadian trade with China has risen to 7 percent from 1 per cent over the last two decades, while trade with the EU has grown to 9 per cent of the total, from 7 per cent. The deal with the EU, known as CETA, kicked in provisionally in the fall of 2017, after Trudeau weakened investor protections to calm opposition in Europe. There are, however, signs European exporters beat Canadian counterparts out of the gate. Canadian goods exports to the EU have averaged $3.78 billion a month since CETA took effect, an increase of about 2.1 per cent compared with the year before. Imports to Canada from Europe have averaged $5.21 billion monthly since the agreement, up almost 14 per cent. Carr said it’s natural that Canadian exporters might need time to pivot away from the U.S. -- adding that ongoing uncertainty will demonstrate the need to do so. Risks remain, aside from uncertainty around Nafta and pushes to fully ratify both the EU and Pacific trade deals. The fate of Brexit further clouds Canada’s trade outlook -- the U.K. is Canada’s largest European trading partner. Canada wants to preserve CETA, or some form of it, with the U.K. if it leaves the EU, Carr said. At the same time, Canada’s arrest of a Huawei’s chief financial officer after a U.S. request sparked a diplomatic standoff with the Asian nation. Carr nonetheless is bullish both that ties with China will endure, and that Canada can draw investment in the current climate.